Since 1998 we have have performed at over 1000 weddings, and my expert advice has been published in New York Magazine, Modern Bride, and Brides New York. Below is an article I wrote with tips for choosing music for your wedding. From the first note played as your guests arrive, to the moment you begin your new life together, the music serves as a true reflection of the unique atmosphere you want to create for your wedding day. Just as your attire, flowers and surroundings convey your personal style, so should your music! Not so long ago, the “Wedding March” was one of the limited choices couples had when coming down the aisle. Nowadays, many other wonderful classical melodies can be used to set the tone for your ceremony – from what have become matrimonial “standards”, to more unconventional gems of the repertoire not traditionally played at weddings. Another option for personalizing your ceremony is to incorporate more contemporary songs which can express even more intimate sentiments. Anything – from jazz favorites, to Beatles classics, to movie themes, to Coldplay – can be selected by couples to share a song with their guests that is dear to them. With access to many fine classical musicians here in New York, you can select music which will be tailor-made to fit the vision of your special day. Is string quartet the norm? Not necessarily – there are many different ensembles you can have, all of which depend on your personal taste, the kind of acoustics the venue has, and how many guests you are expecting. Having less than 130 guests? Then a trio would be fine (or a duo if under 80 guests). Having an outdoor wedding? Then a flute in the ensemble can really help to project sound across a grassy open space. There is a good chance that we have played at your venue before – so please let me know where your wedding is and I can offer my opinion on what has worked well in that space. When listening to our samples, there are going to be instruments that you love hearing and others you don’t care for. For me, it usually narrows down to the flute – some people love the flute with strings and/or harp, or they really prefer just a string sound. 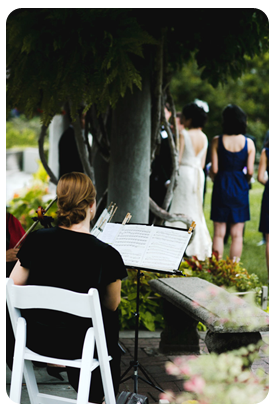 Expecting to have more contemporary repertoire played during your ceremony or cocktail hour? Then stick to ensembles with strings and/or flute (unfortunately, jazz and rock on harp do not really work!) However, a harpist in addition to a quartet with strings and/or flute is truly gorgeous for a ceremony. As you listen to our samples and review our repertoire lists, keep a running tab of songs you like and which speak to you, and songs you don’t particularly care for. From this list, I can get a sense of what styles of music you like and dislike, and will help you decide which selections would be best for certain parts of the ceremony and cocktail hour. If you want the ensemble to play a more obscure or contemporary piece that is not on our CD, website or repertoire lists, please check with me to see if we have it in our library, can purchase the sheet music, or possibly hire an arranger to write it out for us. 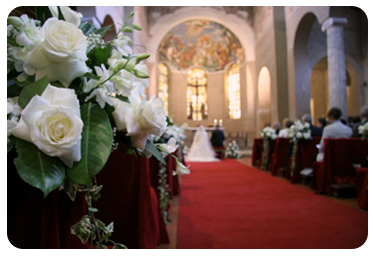 In general, I recommend that my clients decide on one piece for the wedding party, one for each partner processing, and something for the recessional when the ceremony is over. Any additional pieces from your list of favorites can be included in the prelude music preceding the ceremony. However, if you want to have particularly meaningful pieces played for different members of the wedding party as they walk down the aisle, we can certainly accommodate. We can also use some of your favorites during the ceremony, either for the Lighting of a Unity Candle, the Seven Circles in a Jewish wedding, for a moment of reflection between readings, or during another special time (please call for personalized advice on when music can be featured during the ceremony). For the cocktail hour, you can either give us a specific list of pieces to be played, or just point us in a certain stylistic direction and we’ll do the rest. My customized Wedding Worksheet is designed to help you plan all the details needed to make your event seamless. My goal is to have this process be as easy and stress-free as possible for you while still creating a unique and personalized atmosphere at your wedding. your selections can both set the right mood for your guests and make this event truly your own. and tell us what music you want to hear.